Roma grew up in a small town, the daughter of a well-respected, prominent business man. The most dramatic turn in her life occurred when she was just eighteen years old. She made a fateful decision—she decided to elope with her father’s business competitor! Our oral family history states that her father, Fred Rasa never spoke to her again and that she was disowned by the family. Despite this break, I have uncovered instances throughout her life when I know she and her father attended the same events —family gatherings and town celebrations. I found records of this in the unlikeliest of places including the local newspaper, the Sedalia Democrat. As with much in geological research, while I know Roma and her father were present at the same events I cannot know for sure whether a word was ever exchanged between father and daughter after her marriage. Getting back to her earliest years, Roma was born in Florence, Missouri two days after her fellow citizens celebrated Independence Day in 1909. 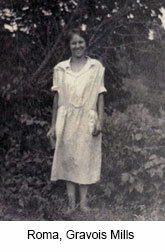 She had two sisters, went to school in Florence, and graduated from the two-year high school in town. Although it is difficult to know for certain, I have gained an impression through my research that from an early age she was already searching for something, even if she did not quite know yet what it was. Her father, Fred, owned one of the three general stores in town. Florence was not a large town and his main rival sat opposite his establishment on the main street. That rival was Carl Siegel. Carl had married in 1914 and had three sons. His wife Mary died in 1919 of influenza leaving him with three young children. 1 In 1921 Carl bought his store from H.A. Bremer and lived in the house next door. His sister Ida moved in with him to help care for the boys. Florence, Missouri had been a flourishing village in the mid-19th century, but its fortunes changed after the Civil War. The event primarily responsible for this reversal of fate was the opening of the railroad in nearby town of Versailles, Missouri. By 1920 the population of Florence was 98 citizens, who lived in 22 households. The townsfolk attended the three churches in town every Sunday. Carl and Roma chose to attend St. John’s Evangelical Church. It is not hard to imagine that the two knew of each other in a town of less than 100 people but it is difficult to say precisely when Roma caught Carl’s eye. One way I have connected with Roma is through family photos. Among her photos I found a few simply labeled “Gravois Mills,” a picturesque location on the Big Gravois Creek (now the northern side of the Lake of the Ozarks) on the southern end of Morgan County. 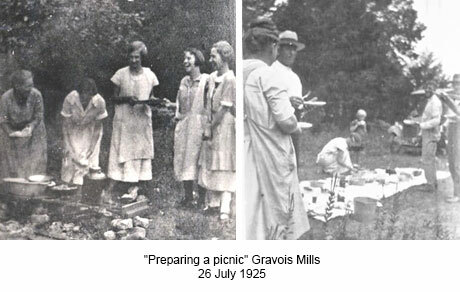 The photos, dated 26 July 1925, show a group preparing and enjoying a picnic. Roma and at least two of Carl’s sisters are shown in the snapshots. While Carl is not clearly seen, it is easy for me to imagine he was there. In my mind’s eye, and perhaps because of how her story stokes my imagination, this picnic could have been when their romance began. Even though I have no hard evidence this is when they began courting, researching her records and collecting family stories gives me a feeling this might the case. Genealogy is not a hard a fast science constructed solely of hard facts such as dates and places; it ultimately seeks to better understand people; the places they lived and worked; and their relationships with friends and family. Fortunately for me, Roma and her family took a number of pictures and as she grew older she took the time to label them. When I look at them, as well as other family mementos, they often act as a portal through time and connect me with my ancestors and heritage. I am reminded of this heritage whenever I look through their records, photos, and mementos or walk through the town in which they called home. On this blog I will continue to share many of Roma and Carl’s stories. I hope you will join me on this journey. 1 Mary Virginia DeHaven Siegel Death Certificate, 1 April 1919. “Missouri  Death Certificates 1910-1967.” Missouri Digital Heritage Website, Missouri  Office of the Secretary of State, accessed at https://s1.sos.mo.gov/records/archives/archivesmvc/deathcertificates/.